And they are getting trickier and trickier to balance. Medications such as Xanax, Demerol (pethedine), OxyContin and now Diprivan are hot media topics since the recent deaths of several celebrities including Michael Jackson. The fact that people are dying from cocktails of prescribed medications doesn't shock me at all. I think it's far more common than we think. In Australia, about 18 million legal prescriptions are written each year to treat pain, anxiety and sleep disorders. That’s almost one prescription for every Australian. Even though I hate taking any medication, even vitamin pills, I once had a close relationship with sleeping pills for a short while. It showed me just how easily addiction can take hold. I was traumatised after leaving a violent relationship. Every time I closed my eyes to go to sleep I would have flashbacks. I was sleep deprived and desperate. I went to a doctor looking for help. In minutes, she prescribed sleeping tablets and antidepressants and sent me on my way. I threw away the antidepressant prescription and filled the sleeping pill prescription instead. They worked. So I kept taking them, increasing the dose as I went. After some weeks, I realised I was 'hooked', so I threw the tablets away. Sleep is often at the hungry heart of the drug beast and it's something to watch out for in those around you. The doctor had been quick to give me drugs to mask my problem but not so quick to help me deal with the root cause of my pain. While there is a very obvious and legitimate place for prescribed drugs they should never be used as band aid measures for what truly ails us. I've no idea just how much of the current level of prescriptions handed out is patient driven as opposed to doctor driven . However, it's no surprise that the system that administers to the sick also acts to prop up the sickness of addiction. And like the parallel universe of street dealing, once addicted, the prescription addict has to work hard to find an obliging prescriber. Many years ago, I discovered my next door neighbour was a pethidine addict. The shame of it all was that she also happened to be looking after my baby daughter while I worked. And of course her problem was something she wouldn't even admit to herself let alone to me. She was a beautiful woman, with a gorgeous and seemingly happy family. She just had this teensy little problem...that gradually took over her life. Thank goodness, it didn't take me long to discover her secret. One day she asked if I would take her to the dentist as she had a toothache. She then said the dentist would not treat her as she had an abscess and she needed to go to a doctor to get antibiotics. Four doctors later, she finally got what she was looking for. Demerol (pethidine). She just shopped around doctors and dentists, with different stories, until she found one willing to give her what she wanted. I don't judge the addicts but I do judge the many 'enablers' who benefit in some way from the sale of prescription drugs. When it comes to our health we need to make sure we understand exactly what we are putting into our bodies. Drugs of any description are serious business. Our health and the quality of our life are serious business. However, we also need to be aware that for some parties, keeping people ill and addicted is also serious business. Be alert not alarmed. And for those people who are interested in reading about the relationship between drug companies and the medical profession, read this or this. It's a fascinating business which sometimes seems to focus more on the money to be made than the quality of human life. Great post. Prescription medications are a huge problem in today's society. The sad thing is most people are so obsessed with the final and quick result, and dont bother to even ask the doctor what the details of the medicine are. Steroids are routinely prescribed to old folks to alleviate conditions, and nothing is actually cured. The usage gets people addicted, and only the doctors and pharma companies benefit. I still see educated people talking about the green pill/blue pill, instead of checking out ingredients. I guess its a kind of side effect of life going too fast.....but I am so glad you posted this. Great post, Lilly! And I have found the same thing to be true here. I've never been a pill taker although in these later years I have had to take some for congestive heart failure and for high cholesterol, but the dosage is low and they don't seem to have any negative effect. But I do believe, like Ugich, that doctors and pharma companies are the ones to benefit the most from peddling pills to so many people who are mostly looking for an escape from -- whatever. I, too, am glad you posted this! Another great post. Sad but true, prescribed drugs can be extremely addictive. A woman once came to my office, she had a story about a child. Suddenly she asked me if I perhaps have something for a headache, a couple of pills. I said no, but I can ask one of the childcare workers if there is maybe something in our first aid kit. The childcare worker told me that the woman has a severe addiction to painkillers; that she made up to the story about the child just to get me to give her some pills. Sad that she had to make up sad stories about her children just to get those pills. I have worked with substance abusers for the past 10 years, and prescription drug use has surpassed any other drugs for causing death. And the scary thing is that anyone can become a prescription drug addict. I will never use meth or heroin, but who knows if I will ever have to have major surgery, or get into a car accident? And like you, I don't even like taking Tylenol. Its an extremely timely topic and your are spot on in your assessment of the times. I was at one time in my life upset by the fact that narcotics and pain meds give me such awful side effects, the few times I've needed them. What a blessing I see that as now... I am so reluctant to ask for anything if I think I can get by on my own. For sleep, I now have tried melatonin. While its an herb, its still a pill I realize, but I am so relieved not to have to rely on it or to be dependent on it. Goof stuff Lilly, I hope many come to read. And so glad you've been able to move forward from a difficult past. I went through two divorces and one miscarriage. Not easy times at all. None of which involved any type of anti-anxiety or sleeping pills. Then I see friends who pop those pills on a regular basis, just to "cope with regular issues" and I wonder, how on earth did I make it through those things and not end up with pills on the nightstand. Maybe I needed them and should have asked for some, but I'm sure glad I didn't. I take meds for my thyroid and for blood pressure control, that's it and I don't like taking those, but I do. It does bother me how doctors prescribes those meds so quickly. Even when they are needed.... after Greg's car accident, the doc said Greg would be in a great deal of pain (he was) and prescribed someone akin to morphine, really strong stuff. Greg read about it and decided he would go cold turkey. It was too difficult, because of the pain level and eventually eased himself off of the meds fairly soon, but yet giving his body time to heal. He probably felt more pain than most doctors would want for him, but at least he didn't get addicted. I'm grateful, because we were both concerned about the addictiveness of the medicine. Wonderful post, Lilly. I work with so many people who are addicted to pain pills, uppers and downers, you name it. Awesome post Lilly. Been a while, hope all is well with you love. I love your new blog layout. Love the photo in the banner it seems so familiar to me what is it? Read the other 2 articles really good. When I fell in the deli they gave me all these drugs for the pain and I just threw them out or didn't fill out the prescrptions. You can only mask the pain for so long until you have to deal with it. thanks for posting this very good stuff and people need to know this. Great post. I could not agree more. Everything's a syndrome or illness, and a lot of the time it's the food we are eating that's effecting us so negatively. I hardly think throwing a pill to an 8 year old that puts away 4 sodas a day is the way to go. My Dad's a psychiatrist and I am all too aware of the "gifts" and perks the drug companies give doctors so they'll prescribe their drugs. Seriously, there was barely an item around our house that wasn't branded Stillnox, Efexor and the like. Luckily Dad wasn't sucked into it and was a fantastic doctor who only prescribed what was absolutely necessary. I know I'm biased but the evidence was in the cards, gifts, baked goods, phone calls and gatherings provided by patients and colleagues alike when he retired. Strangely, there were no gifts or well wishes from the drug companies when he left the profession. Funny that. good post and I agree with your cautionary view. 2) you probably noticed over here in the states we have a health care fight raging. People yelling at townhall meetings, media going over the top (normal for them). So a question for you - healthcare in OZ? Is it like Canada, UK, etc. My logic tells me if those countries systems were so bad their citizens would be seeking to reform it. I didn't noticed groups pushing for reform in Canada or the UK. What do you think about my logic? I'm so with you. I rarely take pills of any kind, unless I HAVE to... I just feel better, well, NOT. I think people shop Dr's for pills more then I ever thought. Look at Michael Jackson, he certainly could buy any medications that he wanted and he did...and he died! It's so hard to find the middle line of caution with medications. They're so valuable and yet so fraught with danger if used unwisely. Excellent reminder Lilly. Thank you. I am always shocked at general doctors passing out sleeping, anti-depressant, ADD, ADHD and major pain killer prescriptions that, in my opinion, should only be written by psychiatrists when a patient is IN TREATMENT! The results can be tragic. We have the same health care system as you do there and I think our doctors work the same way. It is all driven by the Pharma Companies. That has to be the way my doc has gotten all that amazing art onto the wall in his office! This is so true and its frightening. The thing that worries me is gone are the days when you had a GP for 20 years. Nwo you are lucky to keep the same doctor for 6 months. This means that different doctors prescribe different medication. Its the mixing of medication which I think is a big problem. Also people just keep taking pills and doctors do not review the cocktails people imbibe. I really like what Summer said. We need to look at our diets and lifestyles and do all we can to fix our health the good old fashioned way. Then take medication which will cure our diseases or enhance our lifestyles. Its a huge issue and dont get me started on cosmetic injectables like botox - they are exactly the same. Botox is poison yet people know this and keep injecting. Thought provoking post Ms Lilly. Thanks. @ Ugich - makes you wonder about the reasons why we need these props to get us through life like we do. My father takes at least 14 tablets every day. He is so immune to pain killers they do not work. He has had 12 operations in 11 years and claims he rattles because of all the pills. He is also of a generation that would never question what a doctor said or prescribed. He has made it to 82 but even he questions the quality of his life some days. @ Sylvia - you are doing it the right way. Your medication is giving you a quality fo life and is having no adverse side effects. That to me is the right thing. Also, it is something you have only had to take later on in yoru life so you to me are doing what the rest of us should also be doing. It is being used to prevent illness not cause it. @ White Sock Girl - in your job you must see a lot of things - you are a special person to do this work. It's sad for that woman and because she would be so desperate she would not be aware of even doing it. Getting those drugs would be the only thing she thinks about from morning to night. Her poor kids. I just saw something on TV this morning about a woman who was addicted to pain killers for 12 years. She got off them and when she saw her kids again she wondered where they had gone. She had missed 12 years of their lives and could only really remember them before the drugs. Thanks for your comment. Just Say NO... my motto too.. I tried those anti's too and they made me suicidal..big time.. only thing I have to take is the thyroid meds and allergy meds...I have to breathe! Great post! Enjoyed reading what you had to say about drug addiction and the medical industry promoting illness. I laugh at many of the commercials because a lot of the drugs cause more ailments than they cure! Lilly, this was a great post and something we should all be reminded about from time to time. I am on so many pills right now to help me battle my illness, but I think it would be easy for me to overindulge in my sleeping pills just because I don't get any sleep and I am always tired. I actually tossed them in a box where I have to think about whether or not I really need them that bad. As for the relationship between drug companies and doctors... too incestuous and scary! @ Kristina - another person doing amazing work, congrats to you. Now that is scary, more deaths from prescription medication, ouch!! @ Vicky - we are lucky we have been able to see the impact and try and avoid them where possible, thanks for your comment! @ Aleta - well it does not surprise me at all that you got through that because you are a strong person. I did think I should have perhaps filled the antidepressants script and ditched the sleeping tablets but I got through it eventually. And as for Greg, well that was tough going too. I think as long as we are aware and try and avoid just popping pills for the least issue then we will be ok. Sad about your friend and I could have imagined doing the same once. Of course when it comes to surgery or accidents or worse then we dont have much choice. Thanks for your great comments always. @ Gran - you are another one that has a tough and demanding job. I bet you have some stories to tell too. I have known so many people that have been addicted to there parcriptions. When there refills were up they did whatever they faked the symptoms just get another refrill of that one drug, and MOST Doctors do it on purpose so they can get more money. Doctors know what the effects are on drugs its either an addicted drug or drug that causes breast cancr, heart failer ECT..... Doctors know the patients will be back to cure a symtom that started from that symptom that started from that symptom that started from that one perscription. Truer words were never spoken! this is such an important post. I have so many family members who are addicted to prescription drugs. I recently had a doctor attempt to foist some pain medication on me instead of discussing alternative treatments for the arthritis in my feet. I've finally decided to continue w accupuncture, walking and stretching. It is so easy to get addicted. My daughter has a lot of stress in her life and the prescriptions aren't making the underlying causes of her stress and sleeplessness go away. Much easier to take a pill than to work exercise into your life and decide to let go of a destructive relationship...any how...important post. Thanks. Great Post, Lilly.....The people behind trying to abort Obama's Health Care Bill here are The Pharmaceudical Company's---among others---But they are The Big Spenders. They are--so I hear--the Biggest Lobby of ALL, in Washington. What I find so scary is the fact that so very many of these Drugs can be advertised on TV just like Soda or Soap or Lipstick...BUT, when they tell you that these drugs could KILL you, in their WARNINGS, well....the so called "cure" sounds worse than the disease. Anti-Depressants...Children as well as Adults--They seem to be perscribed like Candy. I went to my Dermatologist once, years ago, and he asked, "How are you"? I said..."Well, I've been kind of depressed recently." Without taking a breath he said..
"Why don't you go on an Anti-Depressent?" Hello! I did tell him I didn't mean that kind of Depression.....Sometimes people get Depressed for various reasons....To take a pill for that....I just don't get it. The loss of a loved one can be deeply deeply depressing. PLEASE, just let me have my feelings! Don't try to supress them with a Pill! It does seem like there is a disconnect of some sort between doctors and patients---no real communication. Just write a perscription to shut them up. We are in a terrible mess where all this is concerned. Liily, I'd have done the same thing if I were in a similar situation with any of my children, mother's intuition is undeniable. We read too many horrible things about potential harm towards children who are vulnerable and rely on responsible adults to protect them. What is the difference between legal and illegal drugs, these days. I researched the disorder ADHD recently and one source claimed that Ritalin, prescribed for children as young as two, is potentially as addictive as cocaine. I so agree, we are not only dumbing down the population but we are also numbing them at the same time. People need to be totally aware of the big Pharmaceutical Companies. All of us need to take control as best we can about our health and be informed and do not be passive bystanders. We are commodities and we are used over and over. The USA debates on health reform prove the point. Medication is there for reasons but not to keep people ill and compliant. Read your post with interest ! Not long ago i read "What the brain believes the body manifests-67% of illnesses are the result on thinking sick." I believe there is something in this . I once said to my doctor "I dont often come to see you because it makes me feel ill. He agreed with me and said" Yes, you're better keeping away from these places !" I totally agree. It is just scary how many chemicals people 'pop' in their daily routine. I had a health blip a few years ago where I became very ill and the cause couldn't be defined. Modern medicine only offered masks and not solutions. I ended up going the herbal route and haven't looked back since. None of my family take any sort of medication now unless it is from the herbalist and that is just herbs. More people need to be aware of the possible effects that chemicals/drugs can do to their bodies. This was a very interesting and informative post. When I broke my foot, they gave me vicodin which I took. My fire fighter son said, "Don't take it unless you absolutely need it." I didn't. He warned me of the addiction. There is a nexus between pharma industry, doctors and clinics in our country. And these people have some goals that need to be met. And for that they go to any extent. It is sad that the industry which is meant for promoting health and welfare of the individual look to their selfish needs. If you do land in the hands of the unscrupulous doctor, you are in dire trouble. @ Summer - now that is wise - yes food - we dont even know what they are putting in food do we? I looked at this show on pork the other day - yes I am never eating bacon again...but if you look at packaged meat it will show 87% meat and 13 % other stuff they inject in the meat - its kind of creepy to me. I agree with whoever said that this would make a good blog post. @ Sami - I bet your Dad was a wonderful doctor and I daresay the majority of them are too. I think its the pharma companies who are the issue as you day with all their freebies and kickbacks - it would be tempting I daresay. Like any profession there are the bad eggs and it just means we have to be aware they are out there. @ Lisleman - sorry its taken me a while to get back to you. Like every country in the world our hospital system leaves something to be desired but our healthcare system is a good one. Everyone gets basic medical care here - as in a universal health care system. Thats what Obama is trying to do - have no fear its is way better than what you have. Here, the Federal Government pays a large percentage of the cost of services in public hospitals. People who earn over a certain amount will pay extra tax as a levy for medicare (1.5%). Then if you belong to a private health insurance fund you get a tax deduction. Having lived in other countries I have to say its very good. Of course we have waiting lists at hospitals. But my father, for example, does not have private health insurance, yet every time he has had problems he has had the best of care. There is no way that any of us here would have to pay the amount of money that you may have to in the US for operations and hospital care. Lilly, how are you?!! I never see you any more adn jsut got your link from a commnet you left elsewhere. I thought I had sent you the link to my new blog. ?Yes, GRrr...had to change it again. (Pesky, nosy others.) Anyway... good to be back! Yes, I;ve known too many peeps on wild concoctions that are ven prescribed but end up being so many ti is almost lethal and defeintely dangerous. Scary. We prescribe things that before you would just have to learn to deal with in other ways adn realise life is just hard. With the vigorous debate over health care going on in this country, I've spent a fair amount of time recently researching various topics, but this is one I haven't spent any time on. You are right, drug-dependence is dangerous, especially as it usually happens so gradually that the addict is in denial till it is often too late. I was given painkillers for two months for a tooth-problem, and I got really scared because whenever there the pain started, I would not be able to rest till i popped the pill. Thank God, that is long ago, and now i am pain-free and pill-free! @ Mmmm - I have been a really slack blogger and busy. I will follow your link to your new blog. What is it with everyone creating new blogs???? 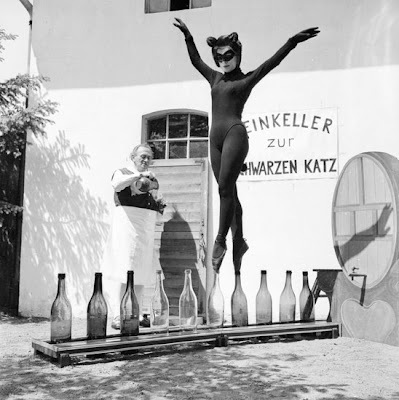 That is some balancing act, I would probably get my toe stuck in the bottle and break my neck, ha, ha. They were saying on TV that you can actually overdose on your own medicine pills if you take way too many at a time. It is too easy to get pills from your doctor, I think he gives them because he does not know what is wrong with you. I know over here Wal-mart and Meijers give out free drugs for your ills. A very good post, you always keep us informed. Have a great week. That's one of the major problems with the modern system of clinics and the push to treat ever more patients (I presume it's much the same in Australia as it is in the UK). Years ago a doctor knew ALL his/her patients more or less personally and that usually meant an almost instant understanding that the symptom was not always directly indicative of as the real cause of the patient's problem. Additionally, they always had time to talk, which is often all the patient really wants - to "spill the beans" to someone who won't judge or repeat a confidence and of course to receive some advice and reassurance - NOT necessarily drugs! Thanks for your comments everyone!!! !